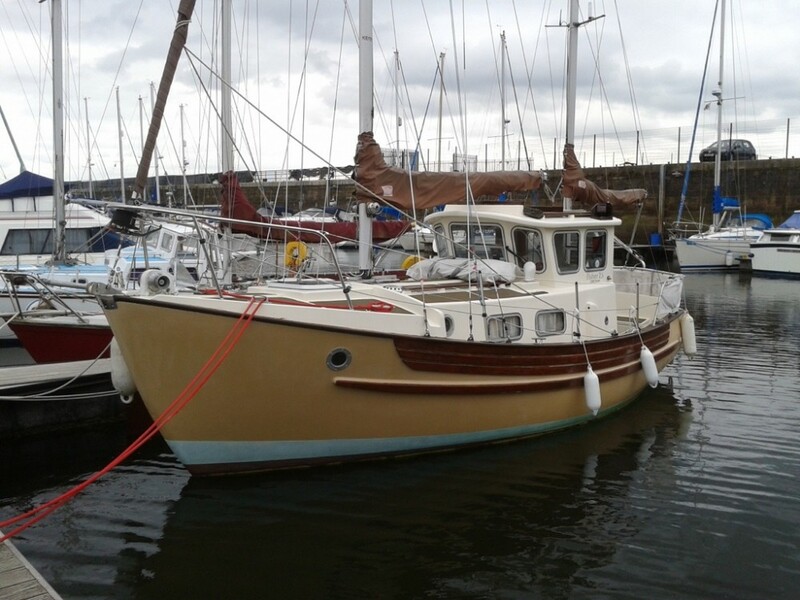 Hi, this is our attempt to publish a blog on the refurbishment of our Fisher 25 Antares. We have recently purchased her from a nice chap that has owned her for the past 7 years at Fleetwood Marina. A 1989 Northshore built boat in fine original condition but ready for some tlc and upgrading. Now ashore in the Yard at Fleetwood Marina,the work has started with removal of the heads and pipe work, fresh water bag and enclosure lining ……grotty foam backed vinyl. Forward lockers now painted out and cabin walls ready for lining. Progress to date….. all window frames removed and re sealed with new side lining fitted to all cabins and headling to wheelhouse. new waeco automatic battery charger fitted, consumer unit and boat wired for 240 volt shore supply…fuel tank emptied and a start of cutting out the tank via the rear locker. All antifoul removed and hull moistured checked which was found to be satisfactory. Mizzen mast removed so that the two wood supports under the aft deck could be removed allowing access to the fuel tank. Thanks for sharing your blog on Antares – most useful. We caught up with you both not so long ago at Kip and hope we can again. I would like to look closely at the davit arrangement you have. Thanks Graham, I think the davits are plastimo and are fairly simple to fit. Please have a close look at ours. We will be up at the boat mid September and she is coming out mid October after boat show.